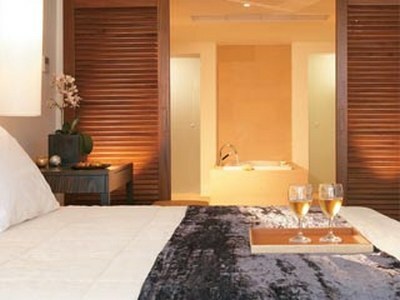 Amirandes's 212 guestrooms range across 20 different types of accommodation and feature over 60 private pools. Sea view rooms in the main palace set the standard for indulgent details which extend to include private gyms, home cinema and state-of-the-art bathrooms with colour therapy and aromatherapy Jacuzzi bathtubs. Accommodation highlights include a Mediterranean "village" and speciality "Dream Villas" that you'll never want to leave. Crete's rich soil nurtures some of the country's finest quality produce, contributing to a diet widely considered to be one of the healthiest in the world. Most of the produce served in Amirandes restaurants is sourced locally, with organic fruit, vegetables, herbs and jams coming directly from Grecotel's Agreco Farm, also based on Crete. The Resort has five diverse restaurants plus a poolside Brasserie and opulent lobby bar. From relaxed Cretan fare in the Xasteria garden restaurant to contemporary Asian dishes at the waterfront Blue Monkey, each restaurant takes inspiration from the surrounding nature and offers a distinct cuisine and ambience. Attentive yet unobtrusive service adds to the pervading air of relaxed indulgence. Guests are also invited to customise their own dining experience, from romantic dinners to family beach banquets, private BBQs to a special celebration aboard a yacht. The Resort also offers a range of customised menu options for children and those with specific dietary or religious requirements. Amirandes's Elixir Spa offers a true sanctuary for the senses where simplicity is key. Six individually designed treatment and massage suites offer signature treatments and Ayurvedic therapies using organic plants and extracts from Crete's rare, aromatic herbs. The spa also contains an indoor pool, relaxation lounges serving complimentary tea and juices and separate men's and women's changing rooms with sauna and showers. Also contained within the spa is a state-of-the-art cardio-fitness gym and Beauty Centre with two manicure / pedicure rooms and hair salon. In-room treatments are available on request. Despite its grand scale, Amirandes's strength lies in its details, with a host of thoughtful, indulgent and state-of-the-art additions transforming it from a special resort into a truly inspirational one. Exotic lagoons flow around natural stone terraces, punctuated with sunken seating to provide the sense of floating on the water. An Olympic-size seawater pool, children's pool and heated indoor fresh water pool are supplemented by over 60 private swimming pools, including Amirandes' Star Pools, featuring multicoloured star lights as well as temperature and current controls. The 212 accommodations feature indulgent details such as private gyms, home cinema and state-of-the-art bathrooms with colour therapy and aromatherapy Jacuzzi bathtubs. The villa area is served by a separate entrance and private beach which is only accessible to villa guests. As cosmopolitan as it is traditional, Crete's appeal extends beyond its pristine 1,000 km coastline to include archaeology and history, sports and activities for the whole family to enjoy. Relive the myths of Greek legend at Knossos, one of the most famous archaeological sites in the world, or step back in time with the donkey-press, water mill and organic Taverna of Grecotel's organic Agreco Farm. Play a memorable round at the dramatic Crete Golf Club, hewn out of the rolling landscape, or indulge the kids with water parks, horse riding and the CretAquarium. Amirandes warmly welcomes families and offers a range of equipment and facilities to ease the pressures of travelling with children. In addition, please feel free to contact us with any additional requests you may have. Bed and Breakfast and all taxes inc.